Last week's Quirks and Quarks science show (from CBC radio) had a segment about Dr. Jessica Whitham's research on infant-directed vocalizations in macaques. The vocalizations share some characteristics with descriptions of human motherese (higher pitch, greater pitch range, etc.). 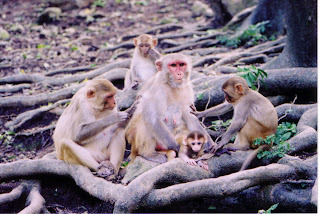 It's not yet clear that this adds macaques in learning their vocalizations, in fact, it's not entirely clear why they do this at all, since it's apparently only directed at other macaque's infants ("Hey you kids, get out of that Jello tree! ").